4K Video Editing on MacBook Air – Is it Possible? So I have been using the MacBook Air as my main editing machine for almost 2 years now and it has been a great companion. Well at least for 1080p video editing. In this video let’s see whether the MacBook Air can handle 4K Video Editing or not. I think this machine is good enough for 1080 p video for editing by final cut pro..That’s it. Fabulous video brother.I just purchased a laptop with i3 7130u.my laptop do not have gpu.can u please tell me that how long my laptop will take to edit 1minute of 1080p 30fps video footage …Please tell me brother. is final cut pro for free?/ if so how can i access that? can it do 4k at 60? with the i7???? Hi. Appreciate the video. 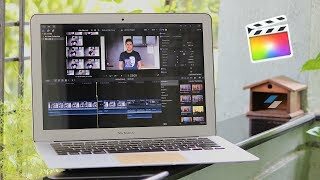 Do you think editing short videos on a MacBook Air using Final Cut Pro can cause any problems with the computer long-term? (And if so, why?) Thanks!! did u apply effect on it? 4k videos shot on a camera like 5d mark iv will be very hard to edit.. I edit 1080p video on a computer that can barely handle it, and it can take up to 40 mins to export a 5 minute video. So if you can take the the time it take to export a video, you should be fine. what video editing app are you using? And it is ok because you are screen recording! After all, FCPX is very efficient so if it works on my 2011 iMac without lag, it should be ok without screen recording. macbook with 4 oder 8 GB RAM? So can I use final cut pro on a MacBook air? whati is the best way for macbook to edit 4k?using proxies/optimized or native? Great video, very informative! Thank you. Wow my PC (hackintosh) can export a 5 minute 8K ProRes clip in 5 minutes (real time). What software do you edit with ? I just want to enquire if i have to use 4k drone shot and gopro videos for my videos will FCP in Macbook Air will be efficient..? And fast! ? Should i go for ASUS? I’m using Final Cut Pro X on a MacBook Air 11” (2015, 4GB Ram, Intel Core I5) to edit 4K 30 fps. Obviously, that would be slow, however I’m viewing in proxy and the video playback/preview is extremely SMOOTH. I’m very amazed at the software optimisation. I also edited 4K 30 fps videos on my iPad Pro 10.5 on LumaFusion and it works tremendously well. The export time for it is for each minute = 3/4 minutes. These two devices paired, gives me the best editing experiences, combined with the application “Duet Display”. what inch macbook is this? Is it fine using ps, lr fcpx in macbook air ? How about 1080pi videos does this air render them faster than 4k or similar to it? Hi Harsh – I have a bunch of 4K videos from my iPhone that I want to cut and make 1 min to 2 min videos for YouTube. Can I downsize the resolution to 1080 and then edit on MacBook Air ? Moving forward I can just shoot on 1080 instead of 4K, but for now is this workable ? I really don’t want to spend money on a Pro since the videos I’ll make are 1-2 min max. Please suggest. I’m in the market for a MacBook Air currently.